Oulton Park Easter Funday was a busy day – Free Practice in the morning as there wasn’t a dedicated test day in the run-up to the event, then straight into qualifying, race 1 and race 2 for both grids. Most of the day was spent in rain or drizzle, the weather only improving late in the afternoon, so that most of the day wet tyres were needed. It was also the first Monoposto Race for a long time using the shortest of the threeOulton Park circuit configurations – the Fosters circuit, meaning a number of lap records were broken by the end of the day. 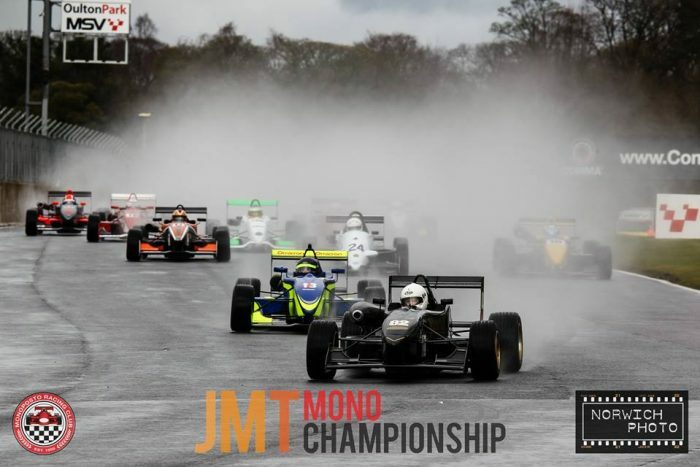 Race 1 of the Mono Mono / 1600 and 1800 races was abandoned by two red flags on the opening laps, resulting in a fairly heavily damaged car, and Race 2 was also shortened by a startline accident which took out three further cars. MSV must be given credit for trying to make the event as appealling as possible for non-racing enthuisasts – there was a fun fair, jousting and an easter egg hunt, and despite the poor weather, the spectator numbers was significantly higher than you would normally expect on a traditional club meeting.